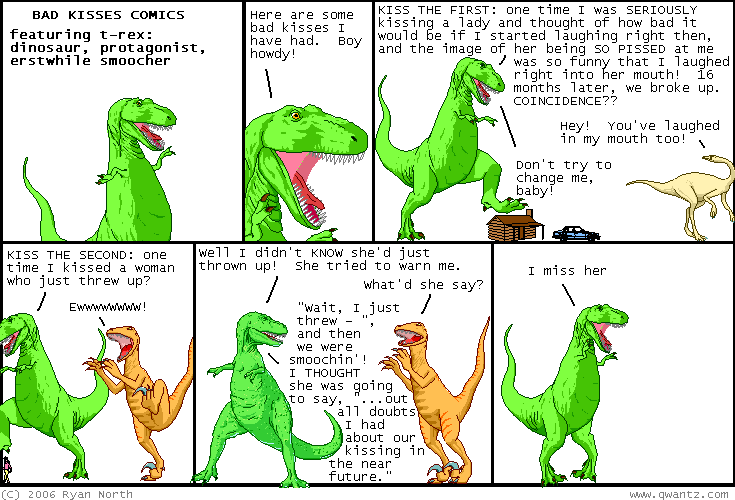 Dinosaur Comics - December 13th, 2006 - awesome fun times! –Time to visit all my wacky friends! So hey, what about Child's Play? It is a charity organized by the Penny Arcade dudes that sends toys, games and money to hospitals in need, so that children staying there can have a slightly better time when they're away from their families. 100% of the money raised goes to this cause: there's no administration fees or anything! It is a very good charity. Inspired by David's good example, I am putting up my own auction! 100% of the money raised from this auction will go to Child's Play. This is an auction for the second painting I ever did! Well actually it is the fourth, since I did the first three all at once and sold them as a set last year. THIS painting is black and white and shows T-Rex stomping on a tiny woman, who is so intense that a starburst radiates from her very head. Also there are halftone dots for that pop-art flair. I painted it when I was sad, therefore it is black and white! That is how emotions work, everyone. That is how emotions work in artists. You can bid here! Imagine having this painting until the day you are dead. 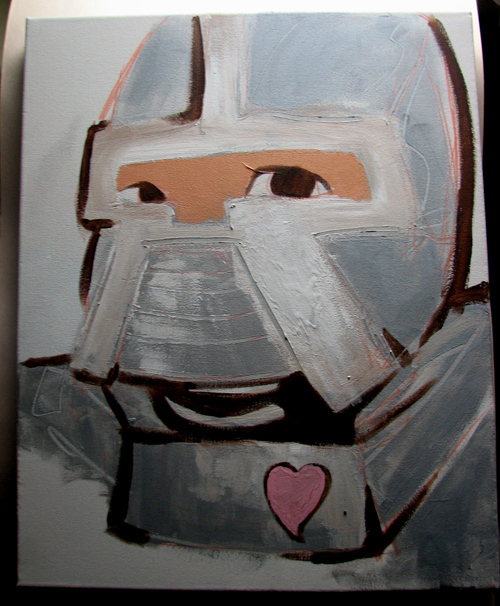 Also my friend Poster Child is holding his own Child's Play auctions, and one's for a painting he's done of a Boomer from Battlestar Galactica as a retro Cylon. Is it not adorable? It is adorable. You can bid here, and also he's got another Child's Play auction here!